I would like to read the Night Falling by Katherine Webb. It features Leandro Cardetta, who having been born into poverty, emigrates to America to make his fortune. He returns home to his birthplace Puglia in southern Italy during the fierce summer of 1921, a rich man, accompanied by his glamorous wife, Marcie, an ex-showgirl fighting middle age. Now Leandro has money enough to hire renowned English architect, Boyd Kinsgley, to renovate a crumbling palazzo into an Art Deco statement of wealth, and host Boyd’s teenage son and his diffident young second wife, Clare, for one extraordinary summer. But tensions are high – the outside world is still reeling from the Great War, and Leandro’s nephew, Ettore, needs his help. Gripped by grief at the loss of his fiancée and love of his life, Livia, Ettore has sworn to identify Livia’s killer, and take his revenge. However He is too proud to go to his uncle for charity, but when he injures himself one day, he has no choice but to knock on Leandro’s door and Reluctantly ask his uncle for assistance. However Ettore ‘s actions have unexpected consequences, as all these lives converge in Puglia and many unanswered questions are asked such as How did Leandro grow rich in America, and what is the strange hold has he got over Boyd? What happened to the first Mrs Kingsley, What happened between Ettore, Pino and the overseer Ludo Manzo in America and Is everything about Federico Manzo, son of Ludo as innocent as it appears and what secret haunts the outwardly exuberant Marcie Cardetta. As time goes by secrets are revealed, relationships deteriorate, hearts are broken, blood spilt and the hardest of life’s lessons are learnt . I am a big fan of good science-fiction films and would like to watch Interstellar which is being released on DVD on Monday 30 March.Directed by Christopher Nolan it stars Matthew McConaughey, Anne Hathaway, Jessica Chastain, and Michael Caine. It was written by Jonathan Nolan and Christopher Nolan, who combined his idea with a script developed by his brother in 2007. Theoretical physicist Kip Thorne, whose works inspired the film, also acted as both an executive producer and a scientific consultant for the film. It takes place In the near future, where Earth has been devastated by drought, famine and extreme changes in climate. With humanity facing extinction, a mysterious rip in the space-time continuum is discovered, giving mankind the opportunity to widen their lifespan. This wormhole can theoretically connect widely separated regions of space-time making it possible to transcend the normal limitations on human space travel and travel the vast distances involved on an interstellar voyage. March 25th has been designated Tolkien Reading Day in honour of the. English writer, poet, philologist, and university professor J R R Tolkien, CBE, whois Best known as the author of the classic high fantasy works The Hobbit, The Lord of the Rings, and The Silmarillion. He was Born on 3 January 1892 in Bloemfontein. 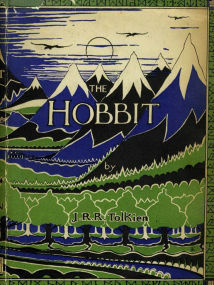 His first novel was The Hobbit which was originally intended as a bed time story for his son Christopher but proved so popular that it was subsequently Published on 21 September 1937 to wide critical acclaim. Set in a time “Between the Dawn of Færie and the Dominion of Men”,The Hobbit follows the sometimes dangerous, but at all times exciting quest of home-loving hobbit Bilbo Baggins who joins the Wizard Gandalf and a company of thirteen dwarves led by Thorin Okenshield on a dangerous journey to the Lonely Mountain, to reclaim the kingdom of Erabor and the many treasures which have been stolen by the fearsome dragon Smaug. Along the way they encounter many hazards including Cave Trolls, Giant Spiders, Hordes of Orcs and Imprisonment by the Elves of Mirkwood Forest, as if that wasn’t enough something decidedly dodgy is also stirring in the Fortress of Dol Gulder, to the South-East of Mirkwood and there is plenty of related material in the appendices of The Lord of the Rings and Unfinished Tales, about the rise of the Necromancer and the subsequent Battle of Dol Guldur. The story culminates in a big battle between the men of Dale, The Elves of Mirkwood, The Dwarves of Erabor, the Hordes of Orcs and the Eagles as they all try to reclaim the treasure stolen by Smaug. The Hobbit became such a success he was asked to write a follow up and Tolkien’s next novel The Lord of the Rings was Published as three volumes over the course of a year from 21 July 1954 to October 1955,as The Fellowship of the Ring, The Two Towers, and The Return of the King. The title of the novel refers to the story’s main antagonist, the Dark Lord Sauron, who Long before the events of the novel created One Ring to rule the other Rings of Power as the ultimate weapon in his campaign to conquer and rule all of Middle-earth and corrupt everyone. He is defeated in battle, and Isildur cuts the One Ring from Sauron’s finger, claiming it as an heirloom for his line.Sadly though Isildur is later ambushed and killed by Orcs in the Gladden Fields, and the Ring is lost in the River Anduin. Over two thousand years later, the Ring is found by a river-dwelling stoor called Déagol. His friend Sméagol immediately falls under the Ring’s spell and strangles Deagol to acquire it. Sméagol is banished and hides under the Misty Mountains, where the Ring extends his lifespan and transforms him over the course of hundreds of years into a twisted, corrupted creature called Gollum. Sadly He loses the Ring during The Hobbit, and Bilbo Baggins finds it. Meanwhile, Sauron takes a new physical form and reoccupies his old realm of Mordor. Gollum sets out in search of the Ring, but is captured by Sauron, who learns from him that Bilbo Baggins now has it. Gollum is set loose, and Sauron, who needs the Ring to regain his full power, sends forth his powerful servants, the Nazgûl, to seize it. Meanwhile back in the Shire, the hobbit Frodo Baggins inherits the Ring from Bilbo, his cousin and guardian. Neither is aware of its origin, however Gandalf the Grey, a wizard and old friend of Bilbo, suspects the Ring’s identity. When he becomes certain, he advises Frodo to take it away from the Shire. So Frodo leaves, accompanied by his gardener and friend, Samwise (“Sam”) Gamgee, and two cousins, Meriadoc (“Merry”) Brandybuck and Peregrin (“Pippin”) Took. They are nearly captured by the Nazgûl while still in the Shire, but manage to escape, and are aided by the enigmatic Tom Bombadil, who seems curiously unaffected by the Ring’s corrupting influence. After stopping in the town of Bree they meet Aragorn, Isildur’s heir. He persuades them to take him on as guide and protector. They flee from Bree after narrowly escaping another assault, but the Nazgûl attack them on the hill of Weathertop, wounding Frodo with a Morgul blade. Aragorn leads the hobbits toward the Elven refuge of Rivendell, while Frodo gradually succumbs to the wound. The Ringwraiths nearly overtake Frodo at the Ford of Bruinen, but flood waters summoned by Elrond, master of Rivendell, rise up and overwhelm them.Frodo recovers in Rivendell under the care of Elrond. The Council of Elrond reveals much significant history about Sauron and the Ring, as well as the news that Sauron has corrupted Gandalf’s fellow wizard, Saruman. 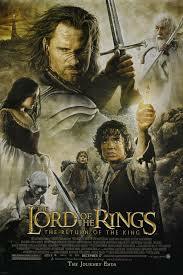 The Council decides that the best course of action is to destroy the Ring, which can only be done by returning it to the flames of Mount Doom in Mordor, where it was forged So the hobbits Frodo Baggins, Samwise “Sam” Gamgee, Meriadoc “Merry” Brandybuck and Peregrin “Pippin” Took, aided by the hobbits’ chief allies and travelling companions: Aragorn, a Human Ranger; Boromir, son of the Ruling Steward Denethor of the realm of Gondor; Gimli, a Dwarf warrior; Legolas, an Elven prince; and Gandalf, a Wizard set off on a perilous quest across Middle Earth to destroy the Ring in the Fires of Mount Doom. Encountering many dangers along the way including The Machinations of corrupted wizard Saruman, The Nazgul, Hordes of vicious orcs, and The Ancient Demonic and fiery Balrog. They are helped along by Galadriel and Celeborn after they take refuge in the Elven forest of Lothlórien. Having been defeated at Helm’s Deep Sauron unleashes a heavy assault upon Gondor. Gandalf arrives with Pippin at Minas Tirith to alert Denethor, the Steward of Gondor, of the impending attack. The city is besieged, and Denethor, under the influence of Sauron through another palantír, despairs and commits suicide, nearly taking his remaining son Faramir with him. 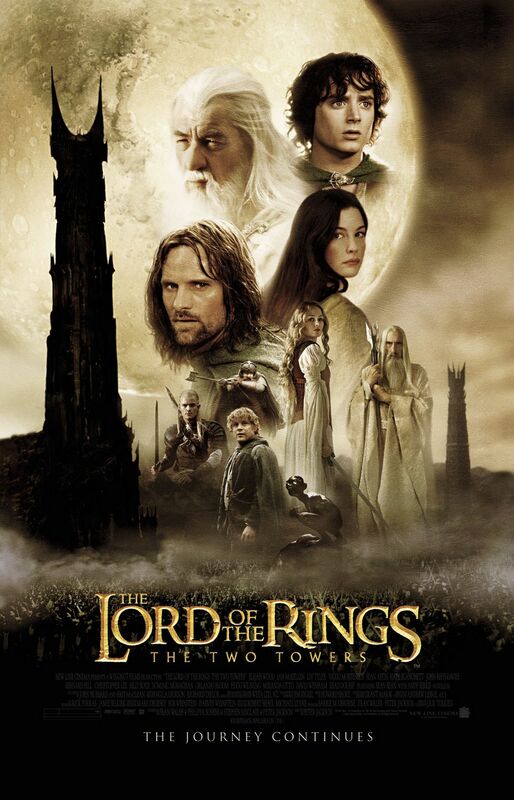 With time running out, Aragorn, Legolas and Gimli take the Paths of the Dead, where Aragorn raises an undead army of oath-breakers bound by an ancient curse. The ghostly army help them to defeat the Corsairs of Umbar invading southern Gondor. The forces of Gondor and Rohan break the siege of Minas Tirith. Sam rescues Frodo from the tower of Cirith Ungol, and they cross Mordor. Meanwhile, in order to distract Sauron from his true danger, Aragorn leads the the armies of Gondor and Rohan in a march on the Black Gate of Mordor. His vastly outnumbered troops fight desperately against Sauron’s armies. At the edge of the Cracks of Doom, Frodo is unable to resist the Ring any longer, and claims it for himself. Gollum suddenly reappears, struggles with Frodo and bites off his finger, Ring and all. Celebrating wildly, Gollum falls into the fire, taking the Ring with him. the Silmarrillion was devised prior to the publication of The Lord of the Rings, Tolkien’s publisher requested a sequel to The Hobbit, and Tolkien sent them an early draft of The Silmarillion which comprises five parts. The first part, Ainulindalë, tells of the creation of Eä, the “world that is”. Valaquenta, the second part, gives a description of the Valar and Maiar, the supernatural powers in Eä. The next section, Quenta Silmarillion, which forms the bulk of the collection, chronicles the history of the events before and during the First Age, including the wars over the Silmarils which gave the book its title. The fourth part, Akallabêth, relates the history of the Downfall of Númenor and its people, which takes place in the Second Age. The final part, Of the Rings of Power and the Third Age, is a brief account of the circumstances which led to and were presented in The Lord of the Rings.Ainulindalë and Valaquenta. Quenta Silmarillion (“The History of the Silmarils”) ,makes up the bulk of the book, and is a series of interconnected tales set in the First Age that make up the tragic saga of the three jewels, the Silmarils. It features the God-like Valar, who create the world for Elves and Men, but are continually plagued by the evil Melkor, who destroys the two lights that illuminated the world, so the Valar move to Aman, a continent to the west of Middle-earth, and establish Valinor, illuminated by Two trees, leaving Middle-earth in darkness. Soon stars began to shine on Middle Earth waking the Elves and the Valar try to keep them safe from Melkor, who is eventually captured. The Elves are invited to live in Aman and some leave, while others stay in Middle Earth, including the Sindar, who are ruled by the Elf King Thingol and Melian, a Maia. Of the three Elf tribes that set out, all of the Vanyar and Noldor, and many of the Teleri reached Aman, where Fëanor, son of Finwë, King of the Noldor, creates the Silmarils, jewels which glowed with the light of the Two Trees. However after being released Melkor, destroyd the Two Trees with the help of Ungoliant, kills Finwë, and steals the Silmarils, fleeing to Middle-earth, and attacking the Elvish kingdom of Doriath. However he is defeated in the first of five battles of Beleriand, and barricades himself in his northern fortress of Angband. So Fëanor and his sons swear an oath of vengeance against Melkor and anyone who withholds the Silmarils from them, inclluding the Valar. The Noldor pursue Melkor, whom Fëanor renames Morgoth. Fëanor’s sons seize ships from the Teleri, attacking and killing many of them, and leave the other Noldor to make the voyage by foot. Upon arriving in Middle-earth, the Noldor under Fëanor attacked Melkor and defeat him, though Fëanor is killed by a Balrog . After a period of peace, Melkor attacks the Noldor but is defeated and besiege for 400 years before eventually breaking the siege and driving the Noldor back. Following the destruction of the Trees and the theft of the Silmaril, the Valar create the moon and sun, which awakens Men who settle in Beleriand and ally themselves to the Elves. The Children of Húrin was also published posthumously by Christopher Tolkien and tells the unfortunate story of the Children of Hurin Thalion who was chained to a rock by the evil Melkur/Morgoth and forced to watch the ultimately tragic downfall of his son Túrin Turambar who is separated from his sister Nienor from an early age and sent to Doriath, and after at first proving himself to be a mighty warrior and achieving many great deeds in Middle Earth and defeating many enemies, falls foul of the sinister machinations of the evil dragon Glaurung around the fall of Elven kingdom of Gondolin. The material was compiled by Christopher Tolkien from The Silmarillion, Unfinished Tales, The History of Middle-earth, and unpublished manuscripts. Steve Norman, British musician with new romantic band Spandau Ballet was born born 25th March 1960. Formed in London in 1976 Spandau Ballet consisted of Gary Kemp and Steve Norman on guitar, later saxophone and percussion. They were joined by fellow student John Keeble and the three met regularly at lunchtimes to practise. Keeble was followed by bass player Michael Ellison. Tony Hadley, then joined as lead singer, Richard Miller replaced Michael Ellison on bass, before Kemp’s younger brother, Martin joined the band a couple of years later. The band was originally called ‘The Makers’ in the early years, but changed their name after a friend of the band, saw the name ‘Spandau Ballet’ scrawled on the wall of a nightclub lavatory during a visit to Berlin. Spandau Ballet, began performing with this name and generating a positive buzz around London. Their music prior to then was in the style of the early Rolling Stones or The Kinks, but became more electronic as they began to hang out in clubs such as Billy’s and Blitz, where they would listen to bands like Kraftwerk and Telex. The Blitz was regarded as the New Romanticism. They released the first single “To Cut a Long Story Short”, just ten days after the band emerged from the studio in order to meet the huge demand created by the buzz they had established, “To Cut a Long Story Short” was an instant British top 5 hit in 1980. This was followed by hits with “The Freeze”, “Musclebound” and the well-received and Gold-certified album Journeys to Glory in 1981. The album had all the hallmarks of what would become known as the New Romantic sound and the sound of the early eighties.The follow-up album, Diamond, was released in 1982 and was certified Gold by the BPI and featured the funk-flavoured single “Chant Number 1″. The second single from Diamond was “Paint Me Down”, the third was, “She Loved Like Diamond”, Trevor Horn remixed the track “Instinction”, which was released as the fourth single from the album. With a slicker, more pop sound, the band released their third album True in March 1983. The album topped the charts all around the world, and launched several international hit singles, such as Gold and the title track which reached number 1 in several countries. The follow-up album, Parade, was released in June 1984 and the album’s opening song was, “Only When You Leave”. At the end of 1984, the band performed on the Band Aid charity single and in 1985 they performed at Wembley Stadium as part of Live Aid. During this same year, Spandau Ballet achieved platinum status with the compilation, The Singles Collection, containing songs like Lifeline and Communication, which kept the focus on the band between two studio albums and celebrated their five years of success. The band split acrimoniously in 1990, and Martin Kemp went on to land an acting role in the UK soap opera EastEnders, while Tony Hadley tried to establish a solo career. Gary Kemp did a little more acting, appearing in a supporting role in the Whitney Houston hit The Bodyguard, and in 1995 he released his only solo album, Little Bruises. Both Kemp brothers also appeared in the film “The Krays”. In early 2009, there was much speculation that the band was set to perform later that year. Although the band did not initially comment on these reports, the official Spandau Ballet website encouraged fans to sign up “for an exciting announcement. The band eventually confirmed the rumours at a press conference. to announce their comeback tour. The band began a world tour in October 2009, starting with eight dates across Ireland and the UK, the first of which was in Dublin on 13 October 2009. They gave their “first public performance and interview anywhere in the world for 19 years” on Jonathan Ross’s BBC television show Friday Night with Jonathan Ross on 24 April 2009. The group released both their new album Once More, which featured two new songs plus reworked versions of their previous material, and the single of the same name on 19 October 2009.Virgin Media awarded Spandau Ballet as the Best Comeback of 2009 in their Virgin Media Awards. American musician, singer, songwriter, and pianist Aretha Louise Franklin was born March 25th, 1942. In a recording career that has spanned over half a century, Franklin’s repertoire has included gospel, jazz, blues, R&B, pop, rock and funk. Franklin is known as one of the most important popularizers of the soul music genre and is referred to as the Queen of Soul, a title she was given early in her career. Franklin, the daughter of prominent Baptist minister and activist C. L. Franklin, began her singing career singing in her father’s church at the age of ten and started recording four years later. After several years in the gospel circuit and with her father’s blessing, she formed a secular pop music career at the age of eighteen, signing with Columbia Records, where she was branded by its CEO John Hammond as his most important act since Billie Holiday. Franklin’s Columbia period wasn’t as successful as hoped and in late 1966, Franklin switched over to Atlantic Records, where she began recording a string of popular hits including “I Never Loved a Man (The Way I Love You)”, “(You Make Me Feel Like) A Natural Woman”, “Think”, “Chain of Fools” and what later became her signature song, “Respect”. Franklin continued to record a string of popular singles throughout the early 1970s, reaching her peak as an albums artist with 1970′s Spirit in the Dark, 1971′s Young, Gifted & Black and the 1972 gospel record, Amazing Grace, which became the best-selling pure gospel album of all time. Franklin’s success in Atlantic peaked after the release of the singles, “Until You Come Back to Me (That’s What I’m Gonna Do)”, “I’m in Love” and “Giving Him Something He Can Feel” and the 1976 soundtrack to the movie, Sparkle and Franklin left the label in 1980 to sign with Clive Davis’ Arista Records label where she switched over from soul and funk music to a more conservative urban adult contemporary sound in the albums, Aretha and Love All the Hurt Away, before regaining commercial success with the 1982 Gold album, Jump to It, produced by R&B hitmaker Luther Vandross. In 1984, Franklin added modern day pop rock and dance elements to her sound, which was integral to the success of her 1985 Platinum album, Who’s Zoomin’ Who?, which spawned the hits “Freeway of Love”, “Who’s Zoomin’ Who” and the Eurythmics members Annie Lennox and David A. Stewart featured “Sisters Are Doin’ It for Themselves”. The 1986 release, Aretha, featured her seventeenth Top 10 single – a #1 duet with George Michael entitled “I Knew You Were Waiting for Me”. Afterwards Aretha did not return to the Gold standard until the release of 1998′s A Rose Is Still a Rose, which incorporated modern day contemporary R&B and which the title track returned Franklin to the top 40 of the pop charts. Rolling Stone magazine ranked her atop its “100 Greatest Singers of All Time” list, as well as the ninth greatest artist of all time. She has won a total of 20 career Grammy Awards, including two honorary Grammys, and she is one of the best-selling female artists of all time, having sold over 75 million records worldwide. In 1987, Franklin became the first female artist to be inducted into the Rock and Roll Hall of Fame. On August 14, 2012, Franklin was inducted into the GMA Gospel Music Hall of Fame.